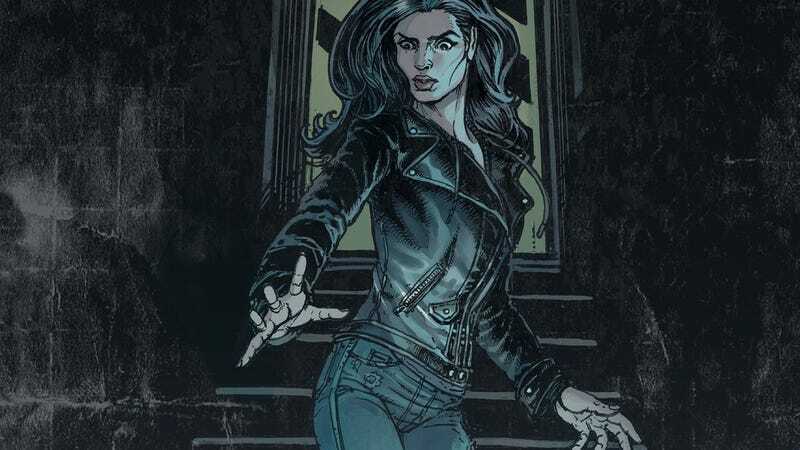 We’re just a few days away from the return of Netflix’s Jessica Jones, about our favorite private eye who’s not afraid to yell at strangers, drink a few shots, and crack skulls in order to get the job done. She’s the perfect pulp heroine, which would explain why Netflix is immortalizing her with a series of pulp fiction episode covers, created by some of the world’s coolest female artists. Returning on March 8, International Women’s Day, Jessica Jones boasts an impressive group of women both in front of and behind the camera—having only female directors for all 13 episodes. So, it’s no surprise they’d also turn to women to create cover art for several of the upcoming episodes. Check out some of the artwork below—the rest have been compiled on the official Jessica Jones Twitter. Getting a Nancy Drew vibe with this cover for the season two premiere. Jessica’s looking a bit like Buffy the Vampire Slayer here. Jessica Jones’ greatest enemy: The stuffed bear. Bonus points for putting this one among an actual pile of books. The season two finale doesn’t look as playful as the title suggests.